Like the mysterious caves portrayed on its cover, The Serpent’s Lair is an opening to an alluring and intense underworld. In many shamanic traditions, the snake or serpent is viewed with sacred reverence. The serpent primarily symbolizes the process of “death and rebirth.” As the serpent sheds its skin, leaving behind that which is outgrown or no longer of use, it quietly prepares to move into a “new life.” This is a vulnerable period during which the snake is left defenseless against outside threats with no guarantee of survival. For the shamanic initiate, this type of challenge must be faced if one is to “step into” this new relationship to life. 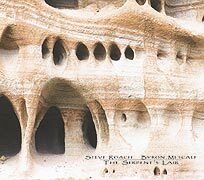 Beginning as a collaboration between Roach and Metcalf, the music on The Serpent’s Lair evolved over the past year into an epic 2-CD set, augmented with a myriad of guests. For those familiar with Roach’s work, this release has it all. Steve’s ultra-soundworlds, hybrid grooves and magical production combined with Byron’s acoustic-organic tribal trance patterns set disk 1 in motion (in all directions). Aligning with themes of shamanic initiation found throughout the world, this disc is rooted in the organic . . . the earth . . . the ancestors . . . and the initiatory energy of focused transformational ritual practice which is integrated into the alchemical fire of psycho-spiritual death and rebirth. It is here that one is confronted with all the essential elements of danger and possibility. Disk 2 — subtitled “Offerings To The Underworld” — is built around musical elements from disc 1, yet forges a sonic alchemy as it dives deeper. Thought at times rhythmic, the overall feeling is a floating, pulsing, breathing adventure through a system of underground rivers and caves, inspiring fantastic epsiodes along the way. Guests on The Serpent’s Lair include Vicki Richards, Vidna Obmana, Jeffrey Fayman, Momodou “Mohammad” Kah, Jorge Reyes, Jim Cole, Lena Stevens and Vir Unis. Just like the Shamanic initiate who journeys within to find his source of power and transformation – like the Serpent shedding its skin – in our contemporary society, we too can choose the path of personal transformation. Such is the way of this shamanic lesson. Steve Roach is restless in his search for new sounds that connect with an ancient source of truth in this constantly changing world. His unique approach and the psychological / spiritual depth of his music have established his position as an artist of ceaseless productivity, constant innovation and open-minded collaborations with others. For over two decades, Roach has created cornerstone recordings that defy classification including Structures from Silence, Dreamtime Return, Well of Souls, and Midnight Moon. With this essential new offering, Roach brings the momentum of his rich career to another level. Byron Metcalf is a drummer/percussionist, psychologist, and shamanic practitioner specializing in methods which utilize non-ordinary (altered) states of consciousness to assist people in healing, personal growth and transformation. This collaboration began with Steve assisting Byron in a formal research study designed to examine the effects of breathwork and sound as a shamanic strategy. Steve and Byron’s unique skills in using music and sound to induce altered states of consciousness proved to be an incredibly powerful and potent combination which they explored in different forms throughout this release. Byron’s Helpers, Guides & Allies CD is available from our site.